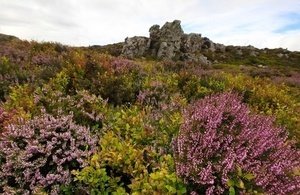 Natural England is calling on the public to donate to their campaign to raise money to purchase and restore one hectare of land on the edge of Stiperstones National Nature Reserve (NNR) called Windy Corner. Stiperstones NNR in Shropshire is famous for its wild and atmospheric landscape and nationally significant geology. The restoration and purchasing of Windy Corner is one more step towards our vision of creating a continuous heathland along the entire 10km of the Stiperstones ridge, allowing an emperor moth caterpillar to be able to crawl from one end of this iconic upland landscape to the other. Once restored, there will be a carpet of purple heather, whinberries and cowberries which will attract lots of invertebrates such as green tiger beetle, emperor moth and green hairstreak butterfly. The charming birdsong of skylark, stonechat and cuckoo will also fill the air. We have a great opportunity here to increase the area of heathland, adding to the iconic Stiperstones landscape. Through the generosity of people, both donations and help from volunteers we will be able to provide yet more fantastic habitat for nature in Shropshire, which people will be able to enjoy for generations to come. Our aim is to raise £10,000 to purchase Windy Corner and restore the heathland using seeds harvested from the nature reserve. Once the heath is established and thriving, it will be lightly grazed with conservation grazing animals. Public support will really help us in reaching our long awaited dream of having purple heather covered hills stretching along the whole of the Stiperstones ridge. It has been twenty years since the first gains and we can almost reach across the gaps that are left.